Here's another fun one from our trip to Santa Fe (here's the first one). We spent a lot of that trip going to look at local art and crafts, like those giant bearded tree monks behind me. Doesn't it kind of look like the one on the right is trying to photobomb? No? Maybe it's just me. I have really strong memories of Santa Fe even though I was pretty young when we went – but it was my first time on a plane, and my mom let me walk back to the hotel by myself one day so I was feeling pretty A+. My grandma was there too, and she bought a lot of rad mudcloth that's still sitting in her insane sewing room (which I showed you once before here and here!). I'm pretty sure I have said this before but I would wear that exact outfit today if I could. 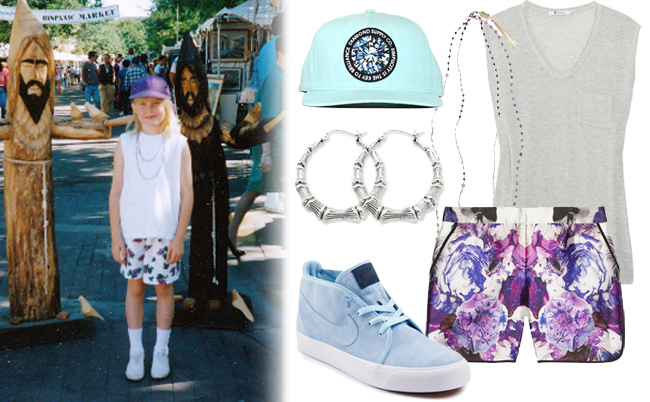 And I probably will buy those Tokis if I can ever get my hands on them (and the earrings and hat too, obvi). If you're new here, check out other My Style Then and Now posts, and submit for Your Style Then and Now if you're feeling nostalgic! Dude, I feel pretty A+ every time I get a MSTN post. I love the whole look, speacially the nike sneakers. Seriously that outfit barely needs updating. how have you always been so radicool, you're my one and only. you are the coolest kid in school!